Ben Gulabin will be a familiar landmark to anyone who has travelled north from Blairgowrie to Braemar. It stands proud above the Spittal of Glenshee, a well established travellers' rest stop which now caters for hillwalkers, skiers and coach parties in the main. The 806 metre high peak is a Corbett, taking its place on a list of Scottish hills originally drawn up by John Rooke Corbett, a district valuer from Bristol and an active member of the Scottish Mountaineering Club (SMC). He compiled tables of hills between 2500ft and 3000ft in height with a drop of at least 500 feet on all sides of the summit. When he died his list passed to the SMC and, following various revisions over the years, there are now 221 Corbetts, which are 'bagged' by walkers in much the same way as the Munros. Ben Gulabin can be tackled in a number of ways. 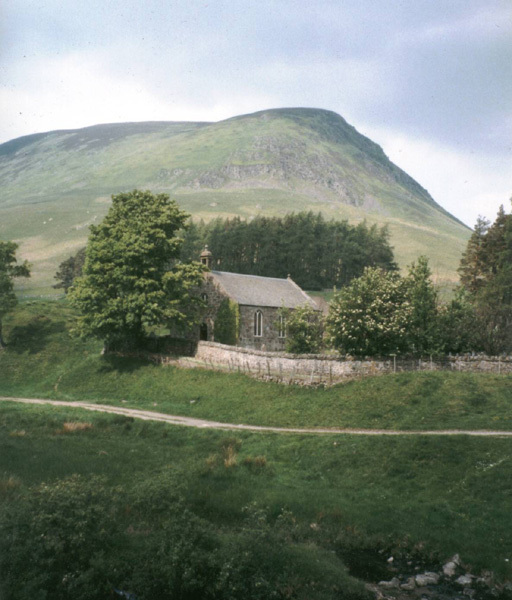 The most direct route to the top involves a leg-sapping climb from behind the tiny church in Spittal of Glenshee. Our route, however, is slightly less steep, starting out from a gate on the roadside about a mile north of the Spittal on the A93. There is space to park at this point. On the other side of the gate a track heads north, rising diagonally across the slope, below the crags of Carn Dubh. It curves gently round the hillside to cross a burn before rising more steeply, the stream down to the left. As you approach the col above, the track reaches the remains of a ruined hut and some old metalwork associated with an early ski development. These days the glen's winter sports activities are located further up the valley at the Glenshee Ski Area. At this point, cross the burn and follow a tributary upstream, a grassy path cutting its way through the heather to emerge on to a wide ridge. Bear right here and climb the final short distance to the summit. The top of Ben Gulabin offers fine views over the surrounding countryside. The most prominent peak to the north is The Cairnwell, an easy Munro to identify due to the mast on its summit. To the north-west is Glas Tulaichean - another Munro - reached from Glen Lochsie below. To the south Glen Shee stretches off into the distance. These days the wide valley is sparsely settled, but that has not always been the case. At one point there were at least 100 houses in the upper part of the glen, a thriving school and a Post Office. The Spittal sits at the head of the glen, on the junction of the burns flowing down Gleann Beag and Glen Lochsie to form the Shee Water. An inn has been located here for several centuries, providing travellers with overnight accommodation and sustenance. One 16th century chronicler suggested that wolves were so dangerous in Highland areas that such 'spitals' were created to offer a safe refuge from the once native creature, subsequently hunted to extinction in Scotland. The finish the walk, retrace your steps from the summit of Ben Gulabin back to the start. Grading A short but fairly strenuous climb. The walk passes through grazing land, so dogs on the lead.